Laugh your night away at the real Last Comic Standing, the 39th Annual Seattle International Comedy Competition! UP Improv hosts the opening night of America’s biggest touring comedy festival, the Seattle International Comedy Competition. 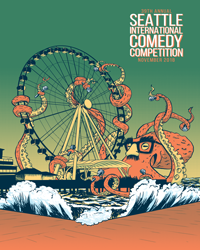 33 comedians from the U.S., Canada, UK, Europe, Australia, and Africa compete for top honors and a shot at over $15,000 in cash prizes. For 26 days with 22 Shows at 18 venues from Tacoma to Bellingham, these talented comics perform 10 minutes sets for you and talent executives from CBS, NBC, and more: movie studios, managers, agents, and producers. Your laughs help the judges pick the funniest of the bunch, so don’t hold back!